There’s something special about a filmmaker who creates a meaningful universe for the characters he loves. Edgar Wright, Simon Pegg, and Nick Frost have been the core team behind three films that take great pleasure in exploring the blights of society and the human mind, dancing beautifully between heartfelt emotion and humor. 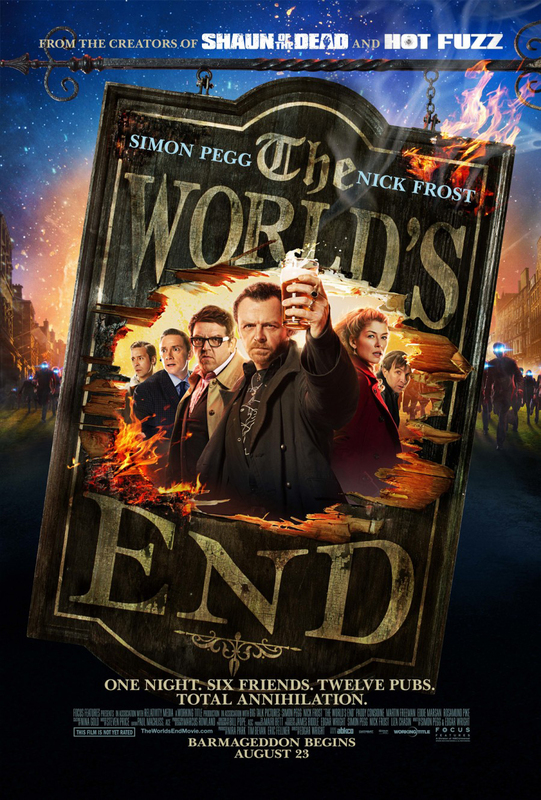 Nostalgia is a common theme that runs through all of the Cornetto films, but it’s tackled with great ferocity in The World’s End. If this film were to be the last of its kind for the trio, it’s a worthy finish that manages to break new ground by challenging the central friendship we have seen grow over the course of the trilogy. Gary King (Simon Pegg) has unfinished business with the town of Newton Haven. At 17, he embarked with his friends Andy (Nick Frost), Oliver (Martin Freeman), Steven (Paddy Considine), and Peter (Eddie Marsan) on the Golden Mile, a booze-fused journey through the town’s 12 pubs all culminating at The World’s End. But 12 pubs is brutal on a 17-year-old’s constitution, and one by one they drop like flies, never making it to The End. Fast forward to adulthood, and we see Gary’s friends have upgraded their school-age insecurities for corner offices and family life, while Gary still roams the hallways of his boyhood kingdom. Then the idea: round-up the boys, and finish what they started. Surely those elusive 12 pints must be eating away at them too. The ultimate message of The World’s End leads to a more ambiguous conclusion then it’s predecessors. By returning to the past, do we find catharsis? And if peace is made, do we start fresh somewhere else with a newfound understanding of our life, or do we pick up right where we left off all those years ago? Is one a denial of the other? Needless to say, this film allows for more of that delicious discussion that fans of Wright’s work covet. Like Shaun of the Dead and Hot Fuzz, this film is heavily layered with cyclical patterns of dense insight that demands a second viewing, and probably a third (who am I kidding, we’ll be watching this film forever). But this story also demands more participation from the audience. The core themes in this film: alcohol abuse, regret, and forgiveness, are complicated emotional struggles that lack tangible representations and therefore are harder to wrap-up in an overarching metaphor. It may make for a slightly weaker film on a structural level, but Wright and Pegg bring this trilogy to new territory by delving into the seedy underbelly of the man-child archetype and not shying away from some of the ugliness that lurks there. So many comedies wish they could accomplish what Wright and team continue to create again and again. The World’s End is cut from the same cloth as Shaun and Fuzz, but its newfound maturity in tackling difficult issues without cynicism makes it a slightly different garment. Wright has already given us years of material to talk about, but The World’s End opens a door for something new, and I can’t wait to walk inside.